A 31-year veteran of the Central Intelligence Agency, Aldrich "Rick" Hazen Ames became famous in 1994 as the highest paid "mole" (double agent) in United States history. Ames made millions of (US) dollars for information he provided to the Soviet KGB, and later Russian intelligence, while a mid-level employee of the CIA. The information he sold to the KGB included the names of Russian double agents and operatives working for the U.S. within the Soviet intelligence community, ultimately leading to their capture, imprisonment, or execution by Soviet authorities. Ames was thus, one of the most destructive double agents to compromise the security of the United States intelligence services. A decade after Ames was born in 1941, his father, a college professor, gained employment as a CIA analyst. Ames attended college at George Washington University, majoring in history. He began working for the CIA in 1959 while still a student, largely because of his father's position there. Ames's performance throughout his career at the CIA was marked by mediocrity. He continued to be promoted, but never attained routine access to the highest level of classified materials. Ames made his first deal with the Soviets in April, 1985, selling CIA secrets for an initial payment of $50,000. Later that year, Ames was sent to Mexico City to recruit new agents. One of his first recruits was a woman with whom he was having an affair, Colombian cultural attaché Maria Del Rosario Casas. Ames married Casas later that year. She aided Ames in his illegal activities. The CIA and FBI significantly delayed the detection of CIA turncoat Aldrich Ames, shown handcuffed, by failing for five years to mount a serious, joint investigation into their loss of Russian agents from 1956 to 1986. The CIA transferred Ames to Rome in 1986, where he stayed until 1988 working for the CIA's Soviet Counterintelligence Division, at the same time selling secrets to the KGB. Although Ames's job was allegedly to recruit Soviet agents (from the embassy in Rome) into the CIA, he failed to successfully recruit a single Soviet agent. His work, however, provided him with the names of Soviet informants and it was this information he sold to the KGB. By 1989, after his return to the United States, he had made enough money to pay cash for a $540,000 home in Arlington, Virginia, an exclusive suburb of Washington, D.C., and another $100,000 for improvements on the house. He told friends and acquaintances he and his wife had inherited money from her family in Colombia. In 1991, Ames was transferred to the CIA's Counternarcotics Division. Although he no longer had authorized access to information his Russian handlers might want, he managed to stay on the payroll by stealing computer files and other sensitive material. The CIA had suspected the presence of a mole in the agency since 1986, when the first two of the Soviet agents Ames betrayed were executed. Suspicions grew with every execution and disappearance of Soviet agents in the late 1980s. The CIA was aware of Ames's extravagant spending as early as 1990. Ames passed inquiry lie-detector tests in 1986 and 1991. However, In 1993, a joint investigation between the Federal Bureau of Investigation and the CIA narrowed a list of 200 suspects down to fewer than 40, and then down to Aldrich Ames. In May, 1993, they launched project "Nightmover," a criminal investigation under the FBI's jurisdiction charged with gathering evidence against Ames. Compiling enough evidence to arrest Ames and his wife on conspiracy charges took nearly a year. Over one hundred FBI agents, some of them elite members of the Special Services Group, tapped Ames's phone wires, rooted through his garbage, planted a wire in his Jaguar, installed a video camera across from his house, shadowed him disguised as trash collectors and lawn maintenance workers, and kept his home under nearly constant surveillance. 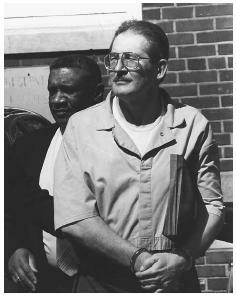 The big break in the case occurred in early September, 1993. Ames was overheard talking on his cell phone with his wife. The conversation included details about a pending deal with Russian agents. A few days later, he was seen near what was assumed to be the signal or dead drop site used by Ames and his Russian contacts. On September 15, the FBI found a note in Ames's garbage can indicating he was arranging a meeting for October. The FBI then obtained a warrant to enter Ames's house. While Ames and his family were away for a weekend in early October, the FBI searched his home, finding in his personal computer detailed information about drop sites and meeting places along with files of classified CIA information Ames had no business taking home. They followed him to Bogota where he was to meet with his handler, Yuri Karetkin, but failed to catch him in the act. Ames returned home $125,000 richer. Nothing happened for four months. Ames appeared to be laying low. Finally, after detecting an unusual number of Russian intelligence officers lurking around Ames's neighborhood, the FBI became worried that the Russians had guessed Ames was under investigation. Ames was scheduled to go to Moscow and the FBI feared he might defect. The FBI decided to act, even though they had not been able to catch Ames actually meeting with his Russian handler. Aldrich and Rosario Ames were arrested on February 21, 1994, and charged with espionage. To prevent them from fleeing the country, the couple were held without bail. The Ames espionage case, called a "calamity" by the Senate Intelligence Committee, remains one of the most remarkable cases of double-dealing in the history of the United States. The case is remarkable not only because Ames made so much money selling CIA secrets and because of the huge amount of information he sold, allegedly compromising over a hundred covert operations, but also because Ames remained undetected for so long. The case prompted an investigation by the Senate into counterintelligence procedures at the CIA and calls from Congress and the public for sweeping reform of the agency. Following the Senate Intelligence Committee's report, some minor reforms were instituted to guard against the possibility of another security breech. Ames was sentenced to life in prison without the possibility of parole. To gain leniency for his wife, Ames plead guilty to all charges levied against him. Nash, Jay Robert. Spies: A Narrative Encyclopedia of Dirty Deeds and Double Dealing from Biblical Times to Today. M. Evans, 1997.